The Farmer Automatic Pelletizer is the economically viable supplement to agriculture. 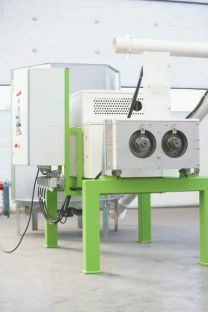 In the fully-automatic, electrically-controlled pelletizing system, any biogenous recyclable materials are pressed to pellets. Depending on the original material, dried manure can be stored long-term without requiring much space. It can also be used as valuable fertilizer or for energy recovery. This solves disposal problems and creates profitable capacities. The pelletizer is delivered as a completely ready-to-use package consisting of the pelletizer, silo, supply lines, magnetic switch-off and switching cabinet with control. The high-performance Farmer Automatic Pelletizer is the perfect supplement for animal management. Pelletization opens up new potential for efficient recycling of biogenous materials. The product can be immediately combined with existing farming systems, or with the Farmer Automatic biomass recovery system.